In order to reduce contamination, l'Ajuntament (municipality of Barcelona) is implementing ever more measures to curb the use of private vehicles and promote non contaminating transportation. As a result, most of Central Barcelona has become a huge pedestrian-only "island". Acccordingly, this tour is specifically designed not to need private transport though it doe include the most important sights of the two main areas of interest: the Old Town and Art Nouveau Architecture + Barcelona's main monument: the Sagrada Familia church. It is also a good option if you cannot afford a tour with private transport. 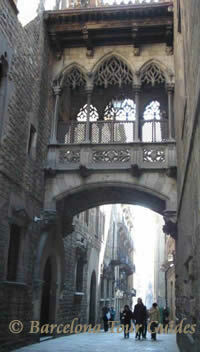 Our itinerary starts and lingers in the maze of narrow lanes making up the Old Town (Barri Gotic). We'll walk past Roman walls to the Gothic Cathedral and to historical landmarks such as the former Royal Palace. The Sagrada Familia Church, Barcelona' main monument, will receive sufficient attention as we'll walk around to see it from all directions. A short taxi or metro ride will take us to Passeig de Gracia, Barcelona' most elegant avenue, to discover two other important works by Gaudí: La Pedrera (Milà House) and Batlló House, besides some of the best examples of turn of 20th century architecture in Barcelona. Gothic District: Cathedral, Roman walls, Royal Palace, Pl. St. Jaume, etc. The order and transport arrangement may vary according to your hotel location or your preferences. The feel: an affordable option to get in touch with the city like a local. This amount is for the whole party (1 to 6), not per person; it includes vat (taxes) and a licensed tour guide service for up to 4 hours. It does not include your entrance fees at optional interior visits. Our recommendation: Sagrada Familia : 18 Euros per person (or 16 Euros for students until 18, 14 Euros for seniors over 65; free entrance for children under 11 and our guide) nor eventual transport expenses (taxi or public transport). For morning tours, we recommend early (8:30h or 9:00h) departure in order to do some of the important sites before they get too crowded.